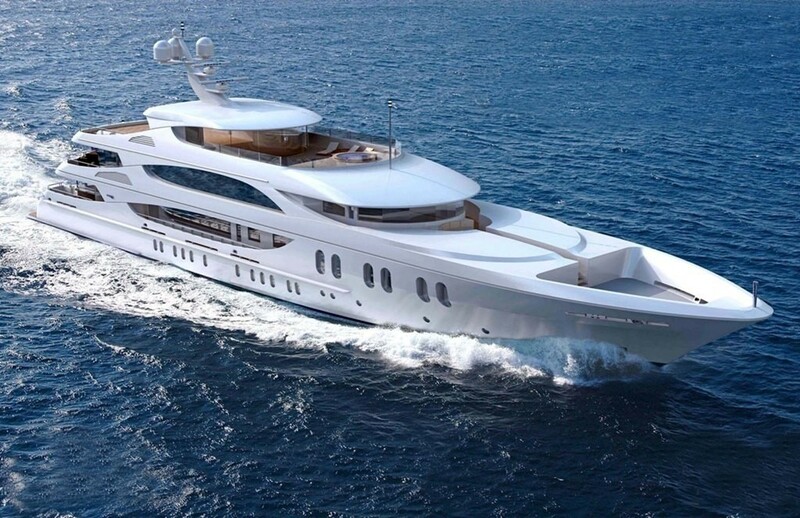 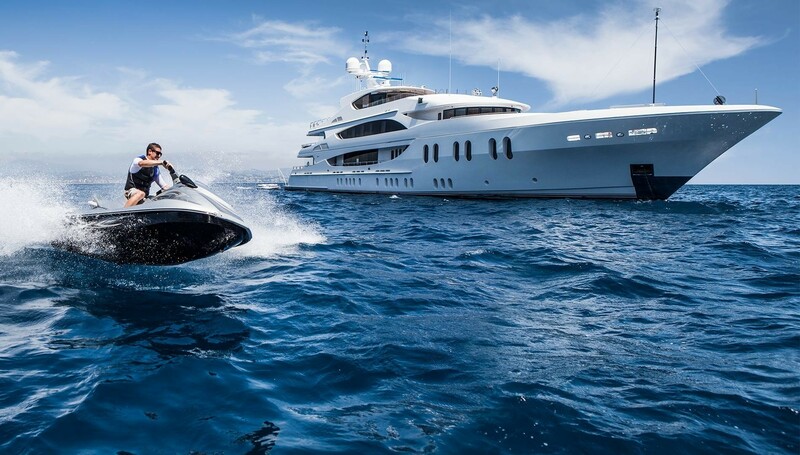 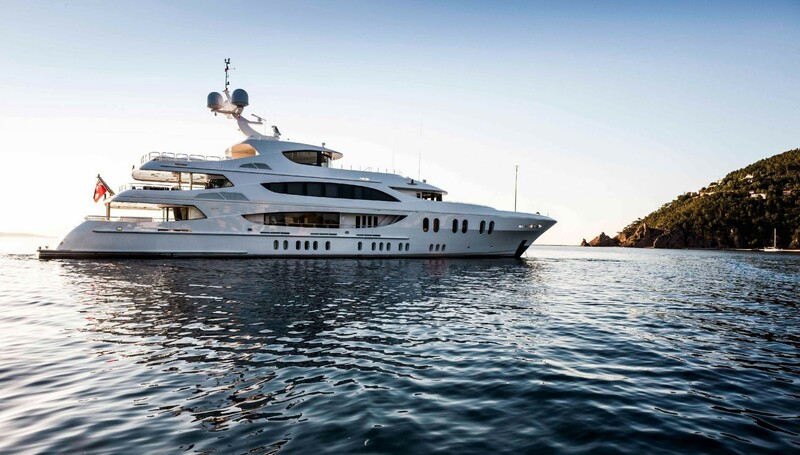 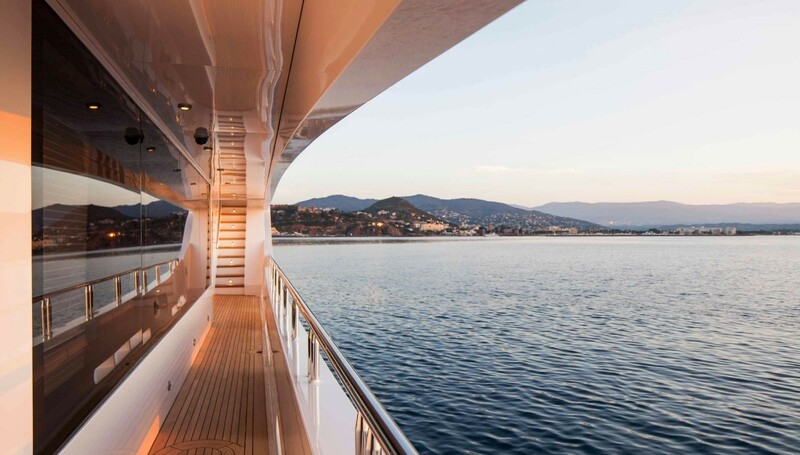 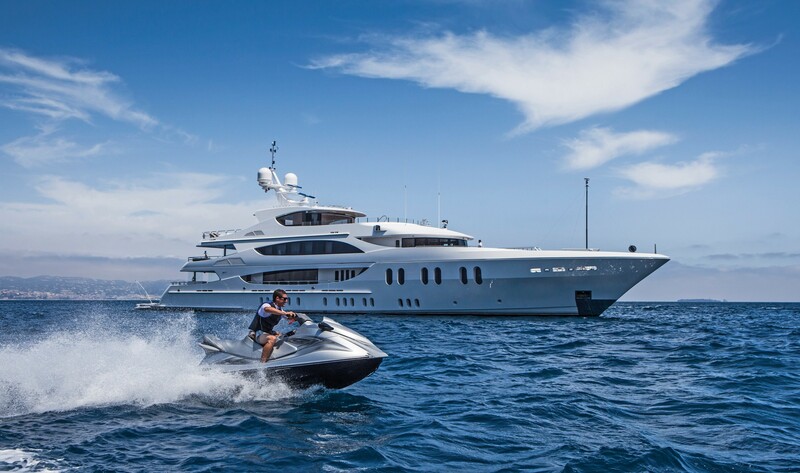 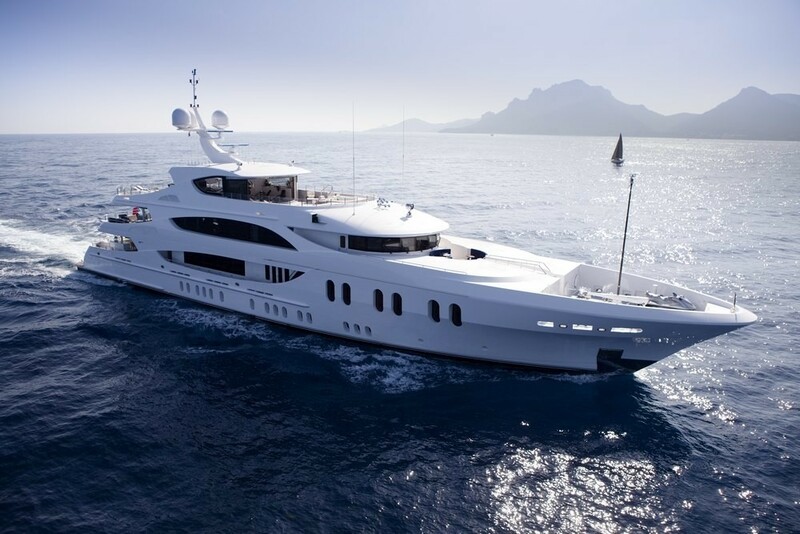 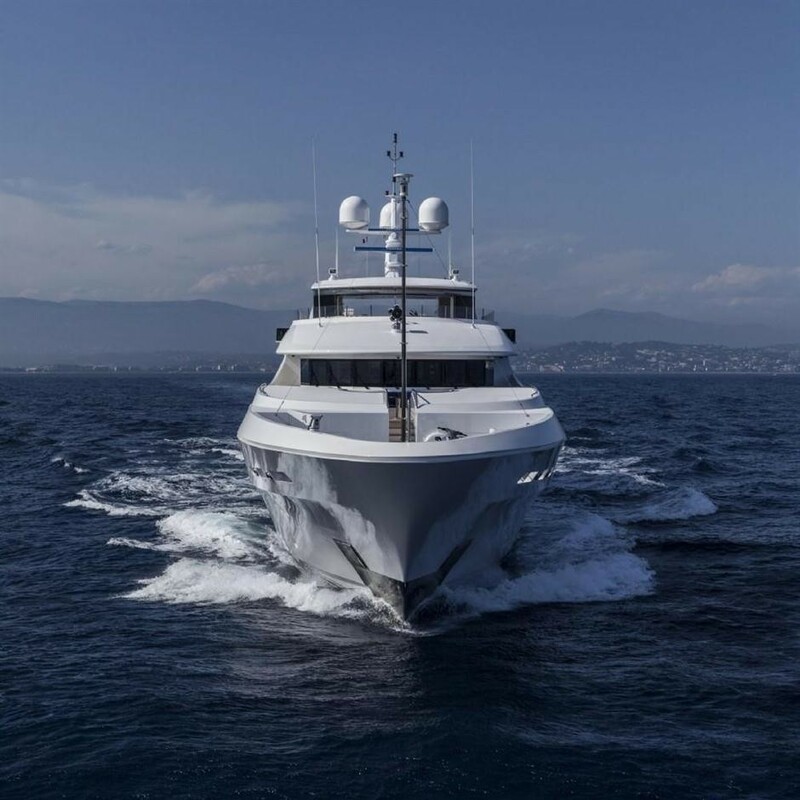 Lavish 57m/187ft custom superyacht by Trinity Yachts was constructed entirely out of aluminium in 2012 and offers guests an extensive range of onboard entertainment and services, including a cinema, putting green and stateroom convertible to a massage room. 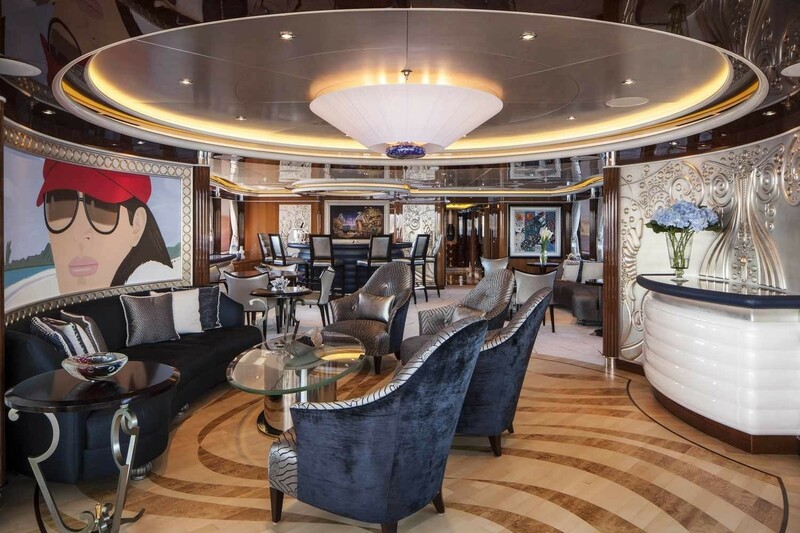 The naval architecture is the work of the shipyard with her rich and contemporary interiors designed by Evan K. Marshall, which accommodate 12 guests over six cabins as well as a crew of 13. 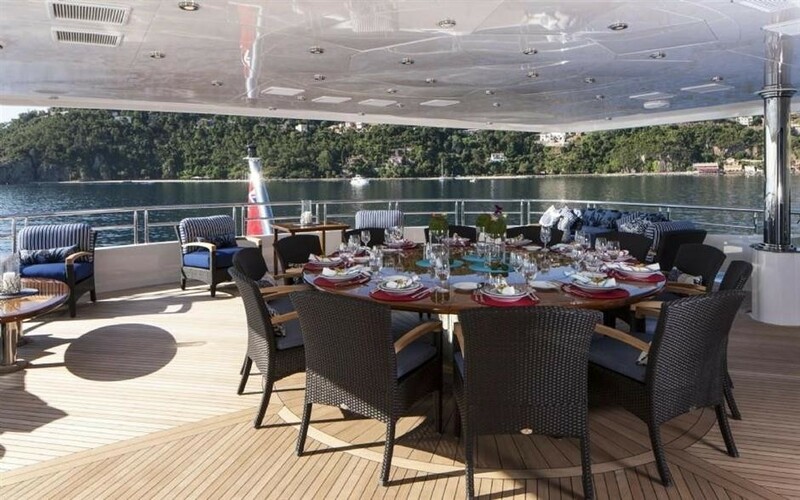 From the swim platform, guests have access to the main deck aft, which offers the largest and most convenient of the alfresco dining options on board. 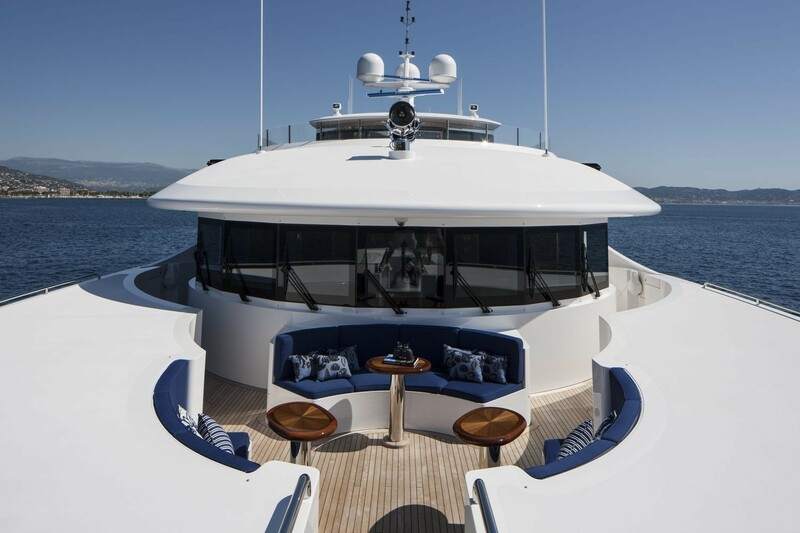 The grand rectangular table seats up to 12 guests, with a sofa along the stern for relaxation after a meal or while waiting for the tender. 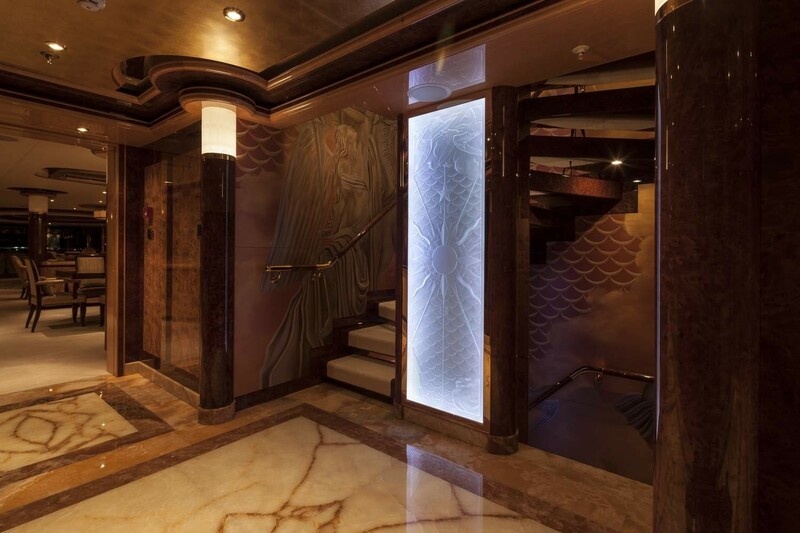 Side-walkways lead past the main salon to stairs connecting to the other decks. 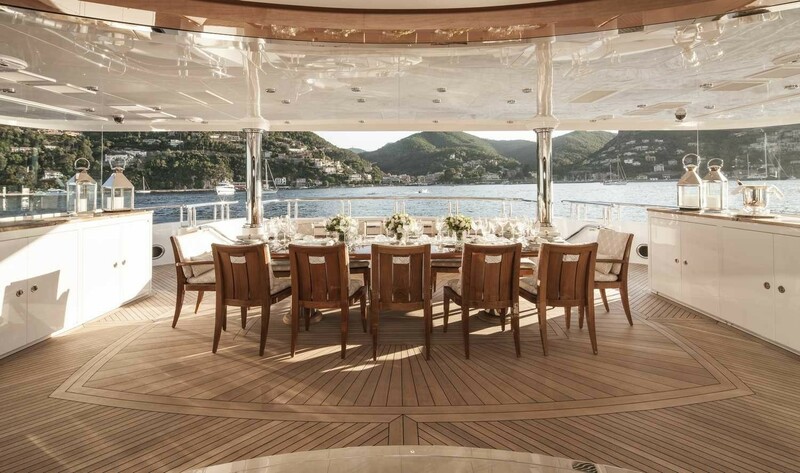 The upper deck is designed for alfresco dining and casual lounging after a meal, with a grand circular dining table to seat 12 placed beneath the shade of the sundeck overhang. 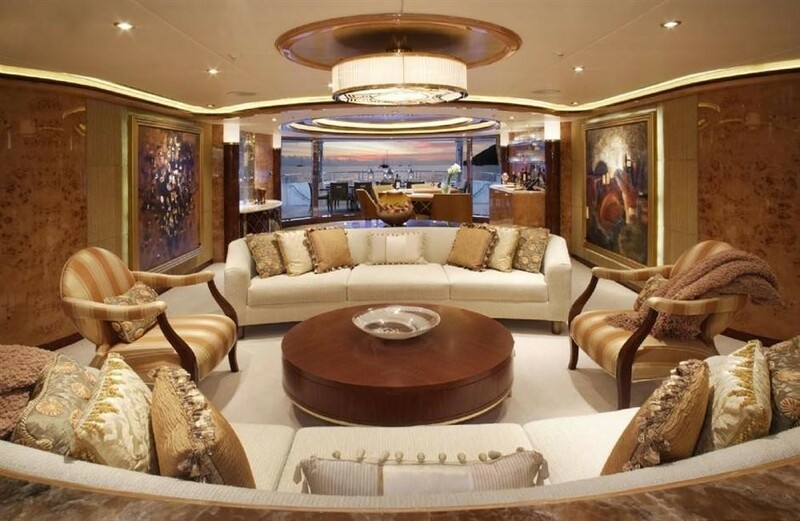 Symmetrical seating is placed in both aft corners, and the social areas are comprised of a large sofa and smaller sofa around an oval coffee table. 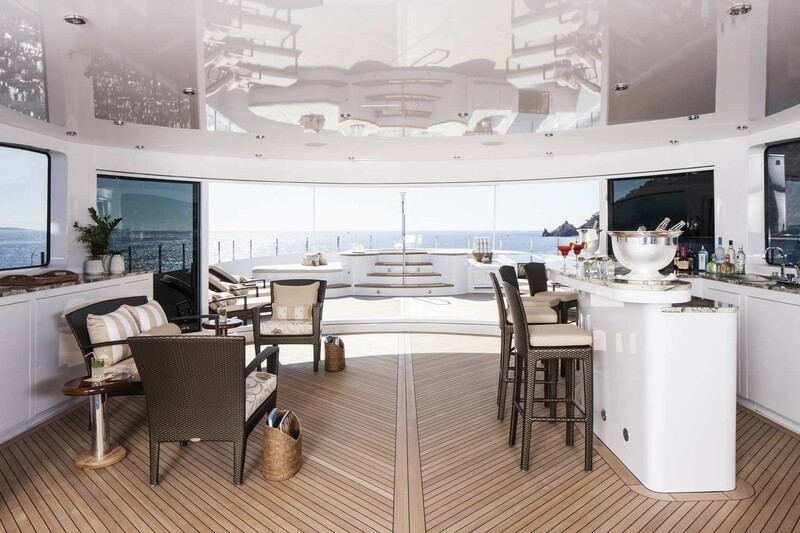 Walkways along the port and starboard sides connect around to the foredeck, where three sofas surrounding a circular coffee table create another comfortable alfresco social space with uninterrupted forward views. 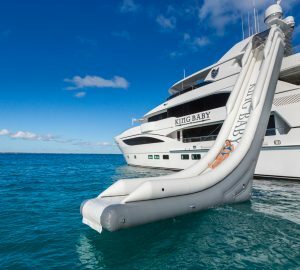 The sundeck aft is used for storing the motorised toys and tenders, which are launched and retrieved using a Davit crane. 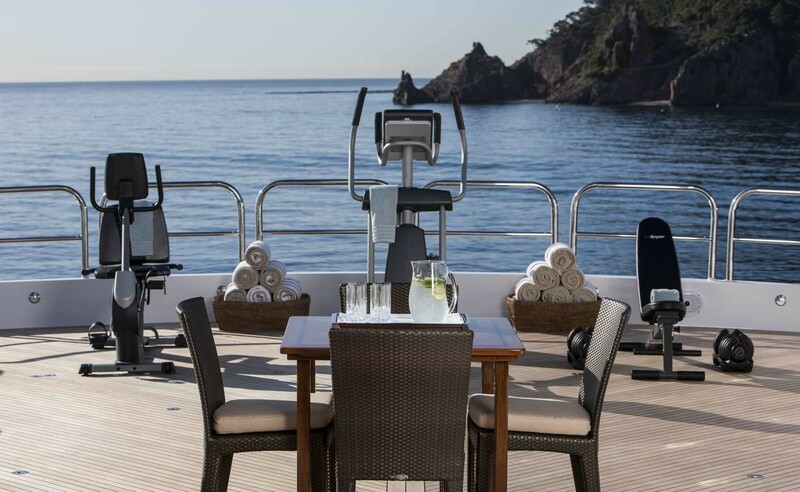 When clear, the area can be used as an extension of the outdoor gym. 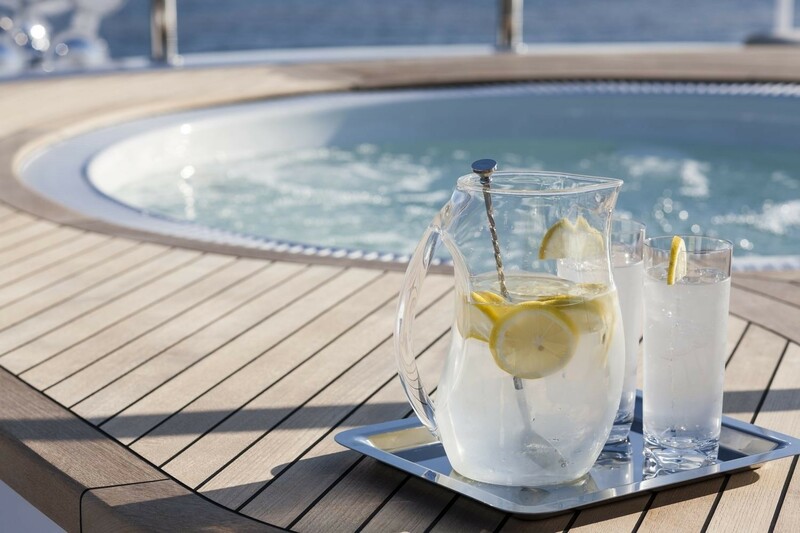 The foredeck is furnished with a raised Jacuzzi for taking in sweeping panoramic views, and for drying off in the sunshine, a sunbed is placed to port and a smaller one to starboard. 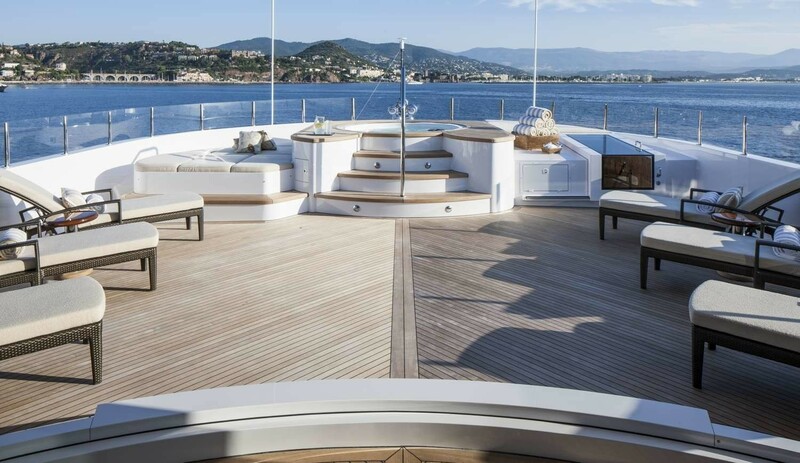 Sun loungers are placed along the sides as an additional sunbathing option. 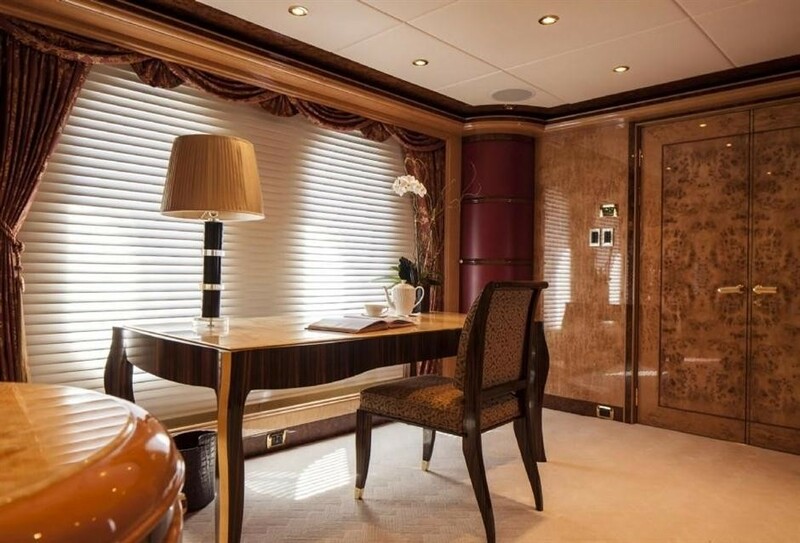 The lower deck layout placed the engine room to the aft followed by the guest accommodation consisting of four VIP staterooms. 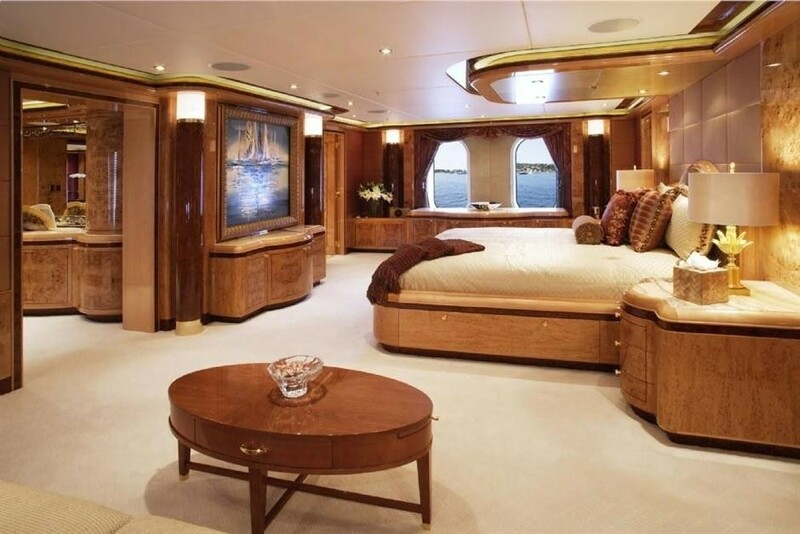 The bow area contains the crew accommodation, mess and facilities. 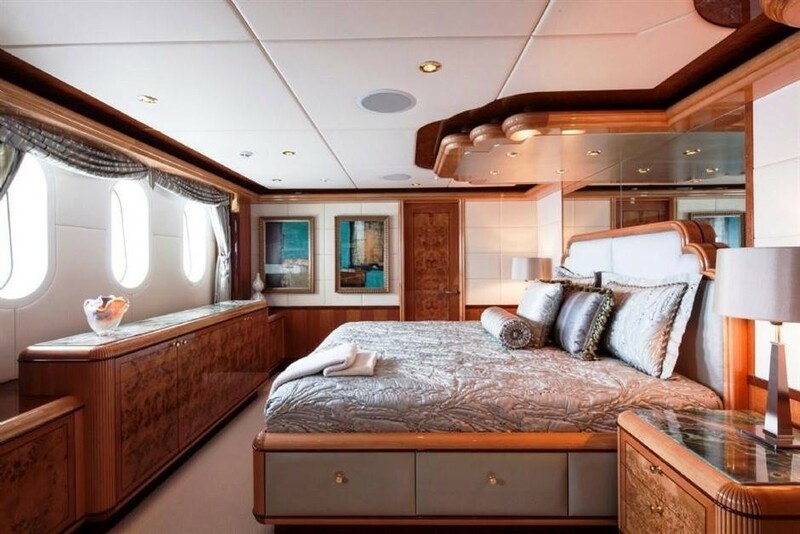 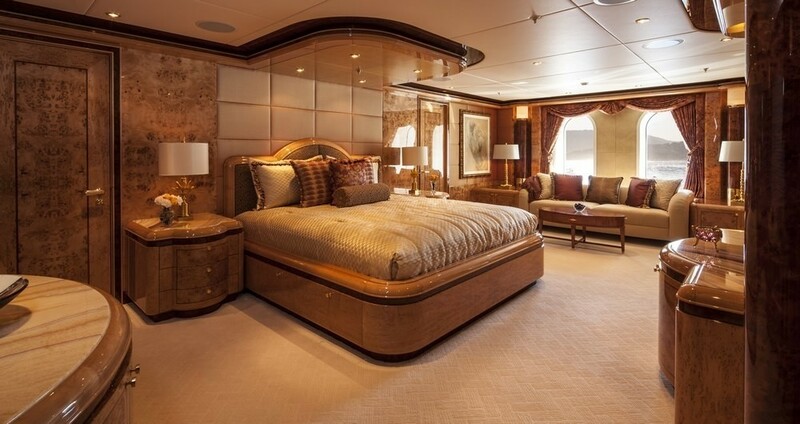 The master suite is placed forward on the main deck, with the main foyer, galley and crew access corridors amidships. 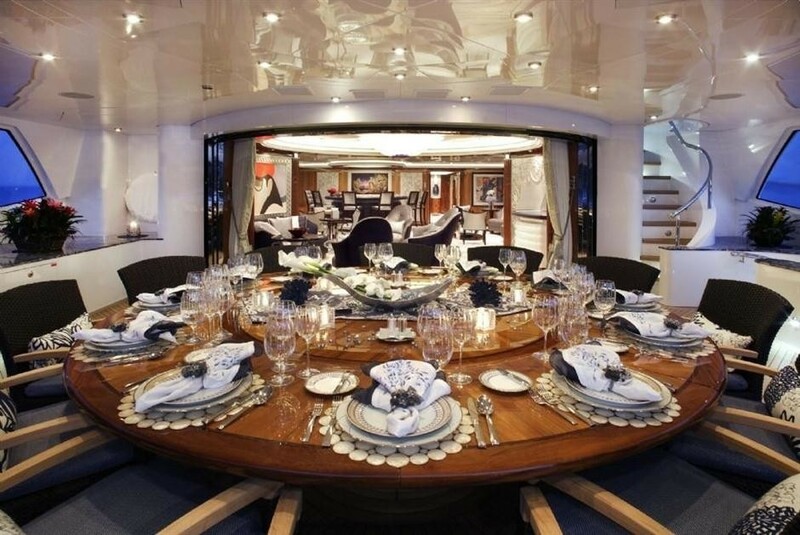 To the aft, the formal dining area is the focal point within the open-plan layout and the finely furnished interior contains back-lit Lalique glass panels and silk carpets, with furniture and cabinetry in birch, vavona and popular burl. 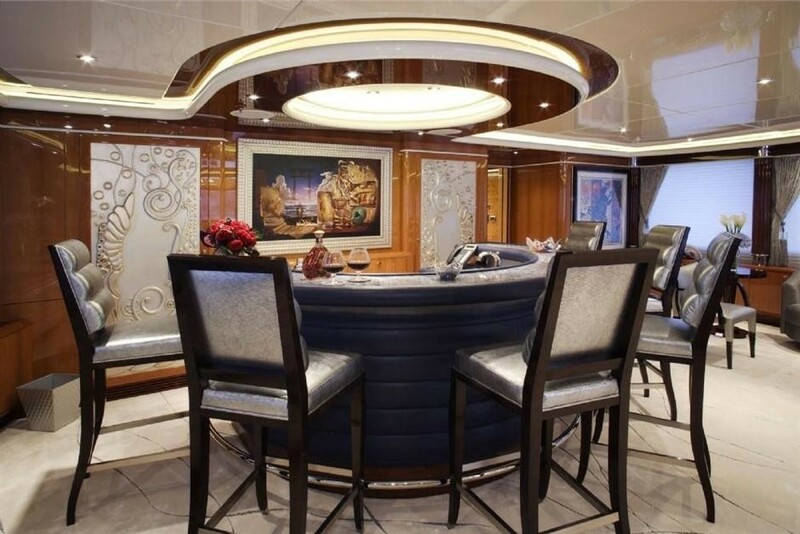 A curving wet bar with an excellent variety of spirits separates the formal dining area from the aft lounge, and there are five plush armchairs to make the area a desirable place for group conversation. 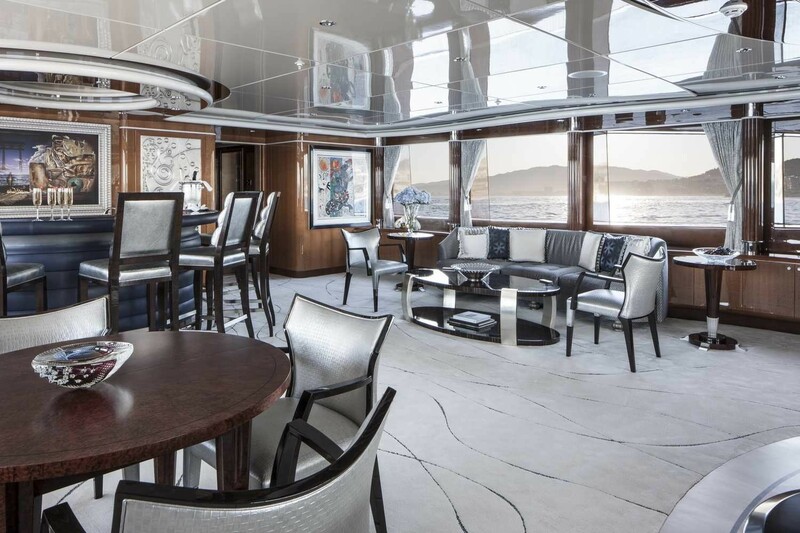 The intimate lounge to the aft offers two sofas and armchairs placed around a circular coffee table for quiet relaxation and conversation between guests. 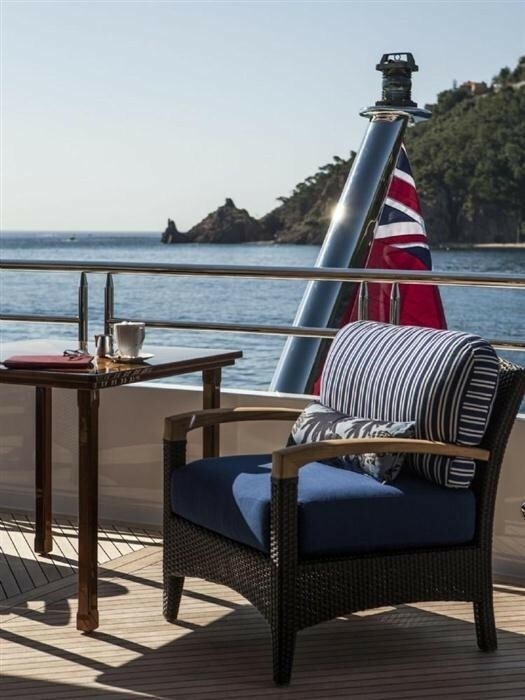 On the upper deck, the forward helm station places a sofa behind the captain's chair for use as a quiet cosy lounge where guests can watch the journey or relax with reading material. 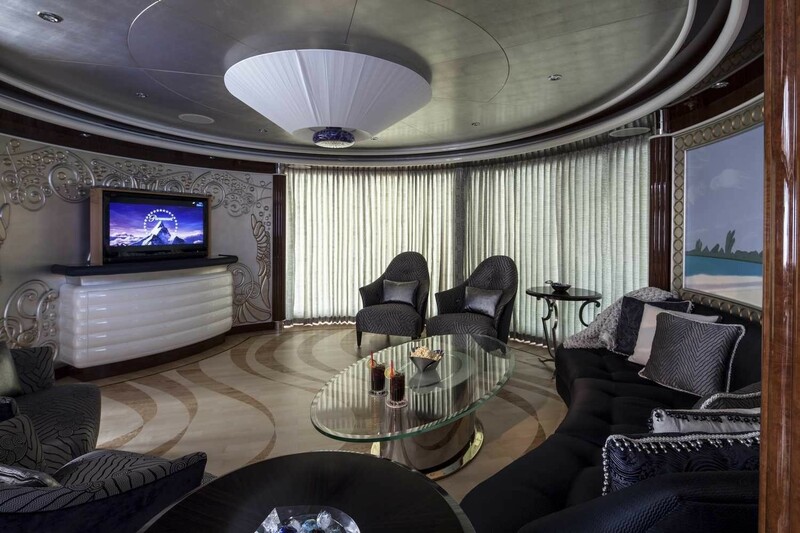 Amidships is the foyer and VIP stateroom which can alternatively be used as a massage room, followed by the aft skylounge which doubles as a cinema. 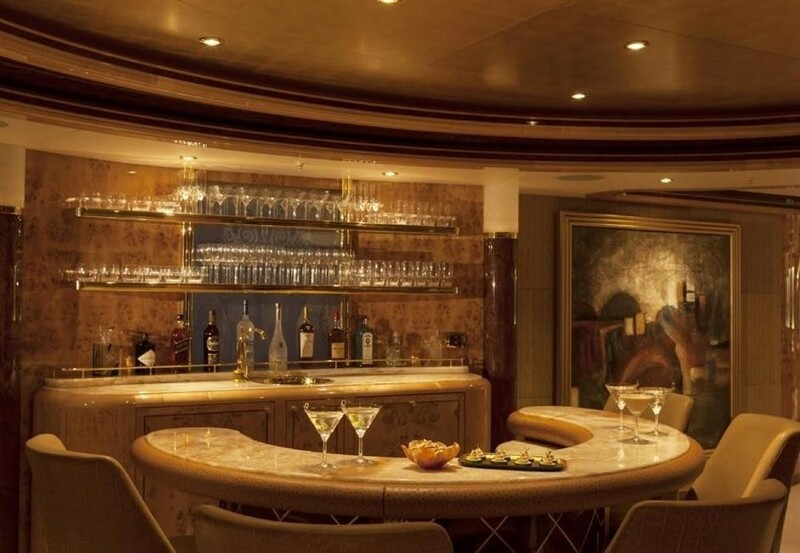 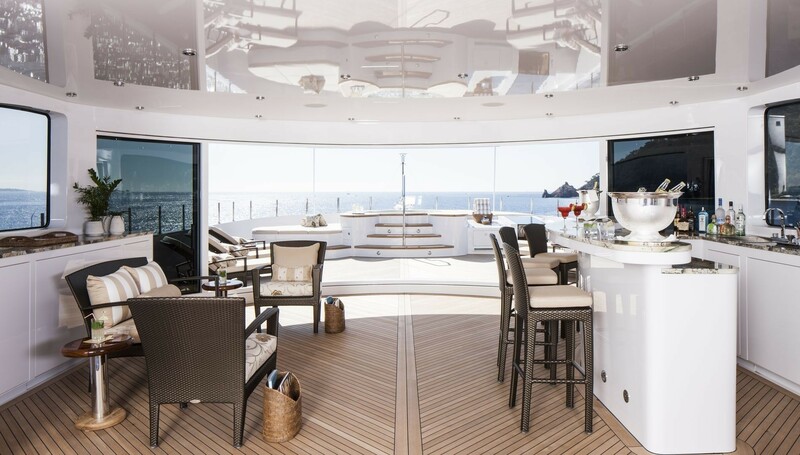 Inside, a semi-circular wet bar serves six seated guests as well as those seated at the port games table, the sofa and armchairs to starboard or the aft lounge beside the circular glass doors out onto the upper deck aft. 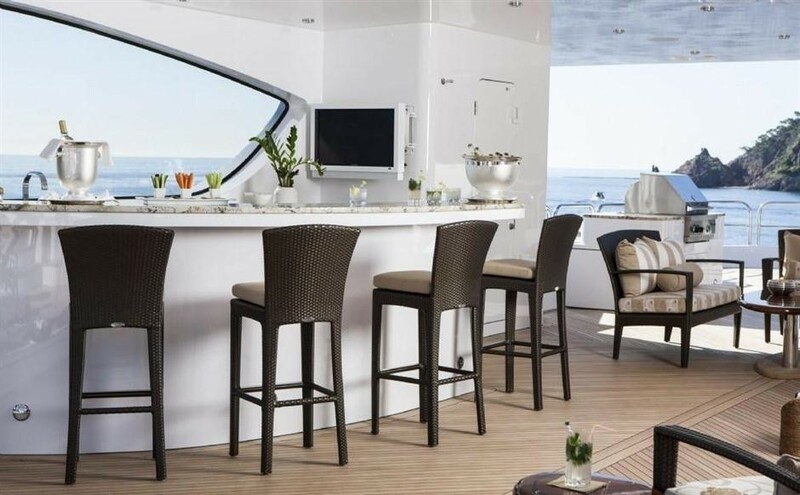 Up, on the sundeck, the central area can be opened to the elements to become an alfresco dining area and gym, with air conditioning, a wet bar and casual seating. 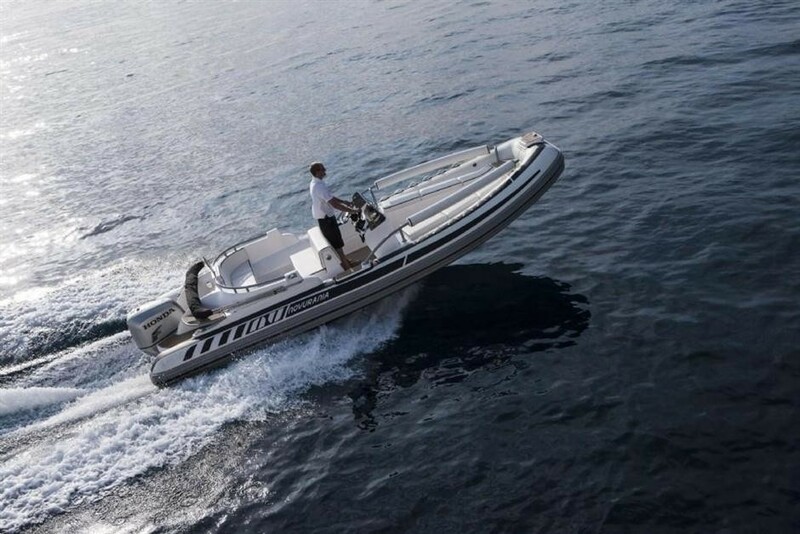 A pair of Caterpillar 3516C HD engines producing 3,384 HP each allows for a maximum speed of 21 knots and a cruising speed of 14 knots with a range of 3,000 nautical miles. 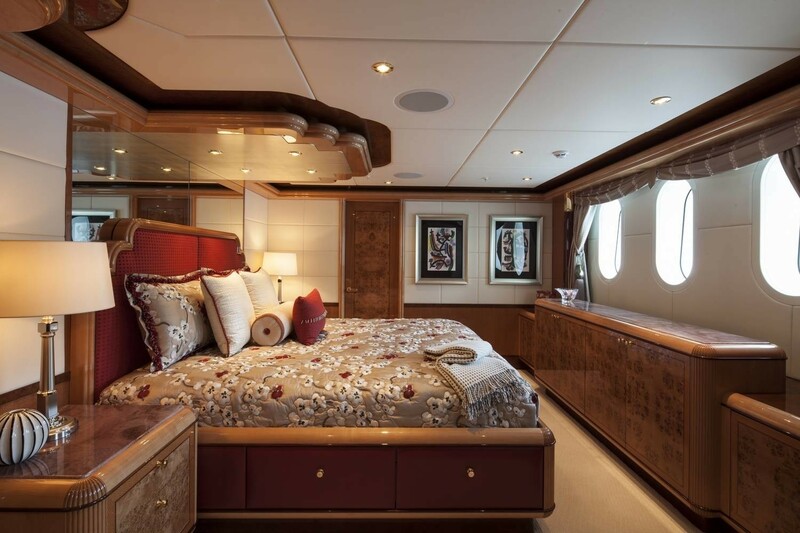 The accommodation sleeps up to 12 guests across 6 en-suite cabins: 1 Master suite and 5 VIP staterooms. 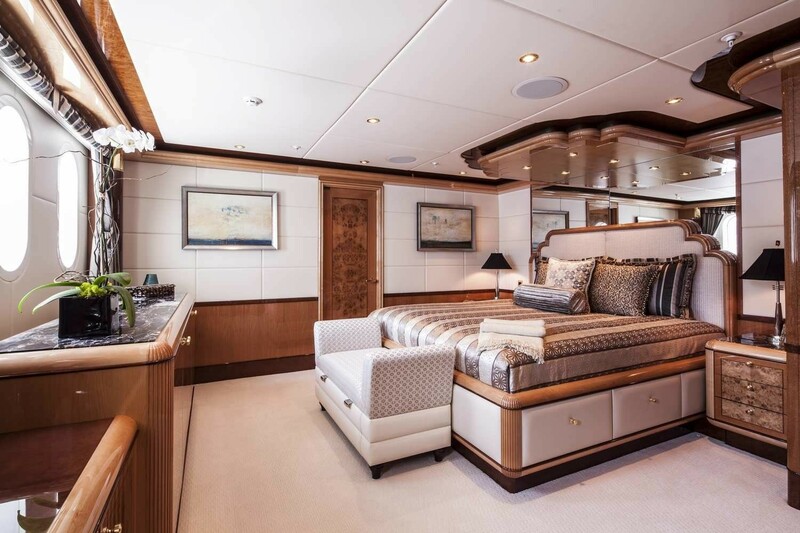 The Master suite is placed on the main deck to take advantage of the full beam and features his-and-hers en-suite bathroom with the 'Hers' section containing a shower, dressing table and Jacuzzi tub while the 'His' bathroom contains a shower. 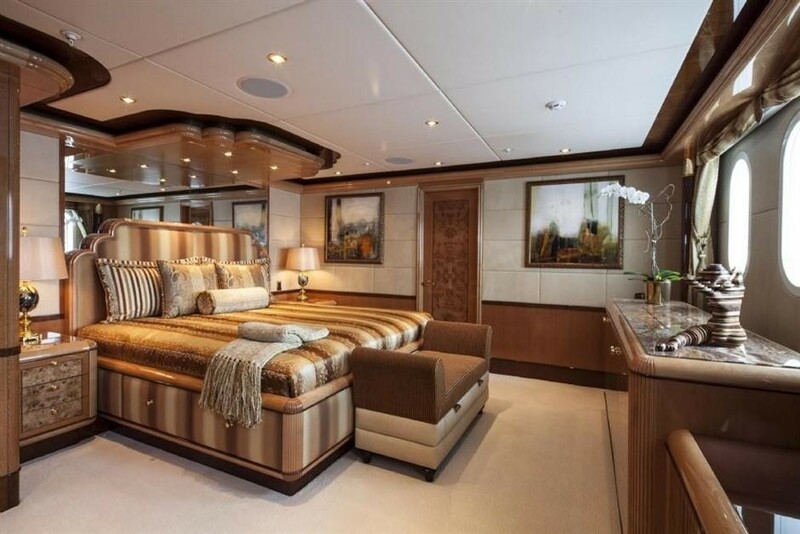 The Master suite is accessed via a private office, and the bedroom is furnished with a king-sized bed, a loveseat and a coffee table, all of which benefit from plenty of natural illumination through the large windows. 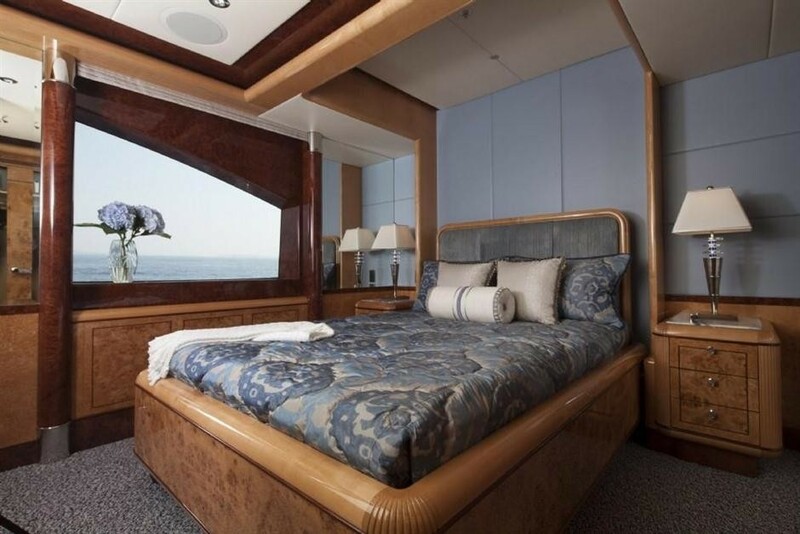 ~ Four staterooms are placed amidships on the lower deck, and each contains a desk and a love seat as well as an en-suite bathroom fitted with a shower. 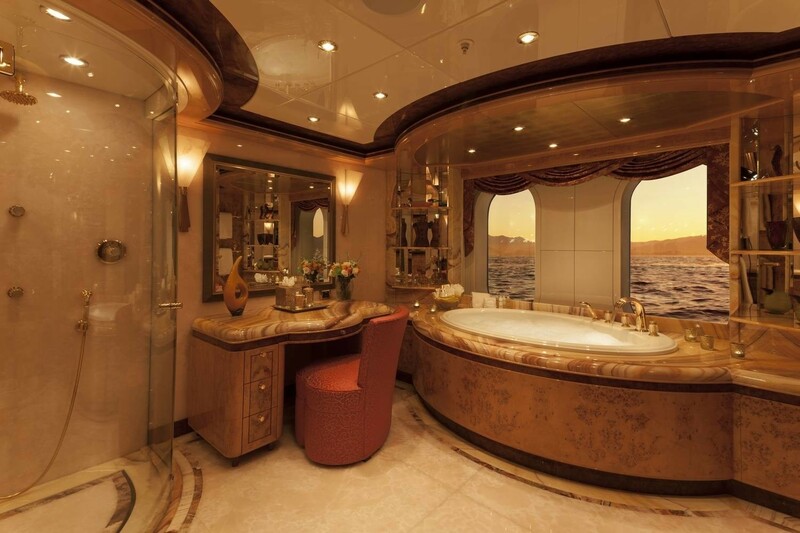 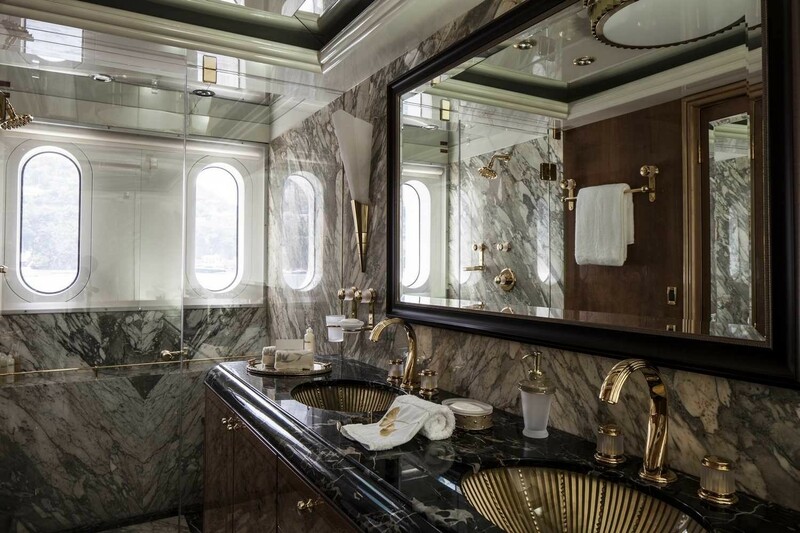 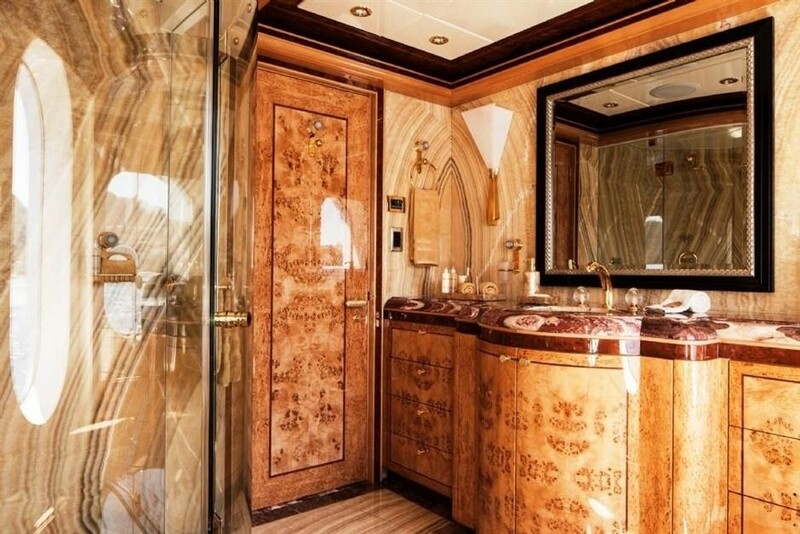 ~ The final VIP stateroom can be found on the upper deck, and if not occupied it can be transformed into a massage room with en-suite facilities. 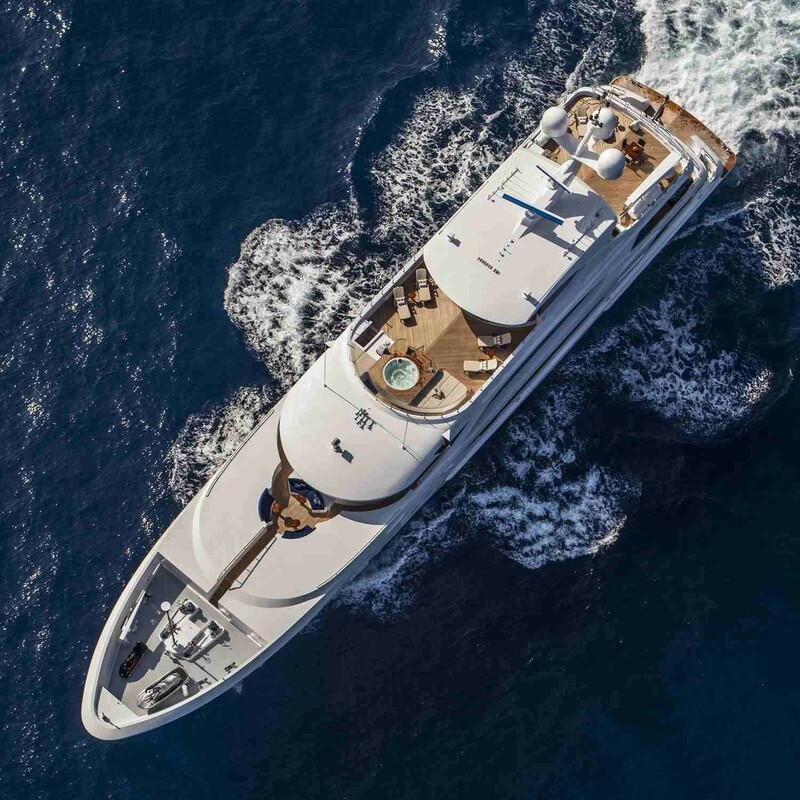 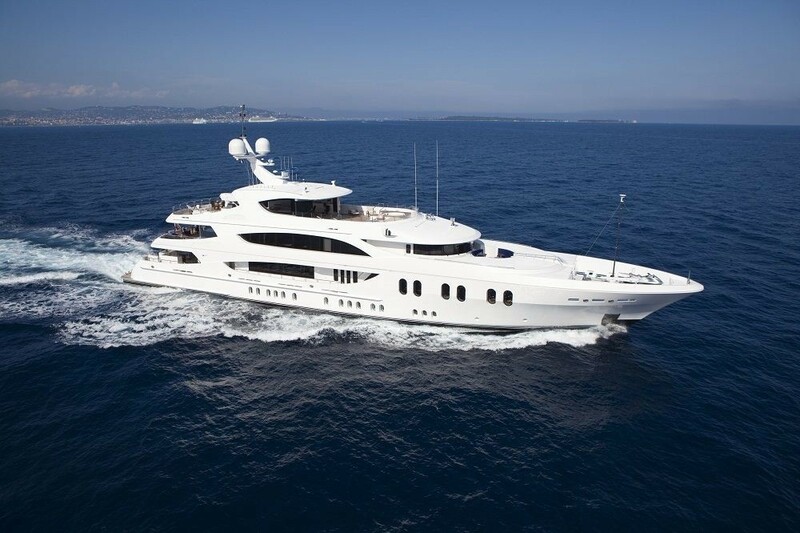 We do have available further amenity, owner and price information for the 57.00m (187') yacht 57m Custom Superyacht, so please enquire for more information.